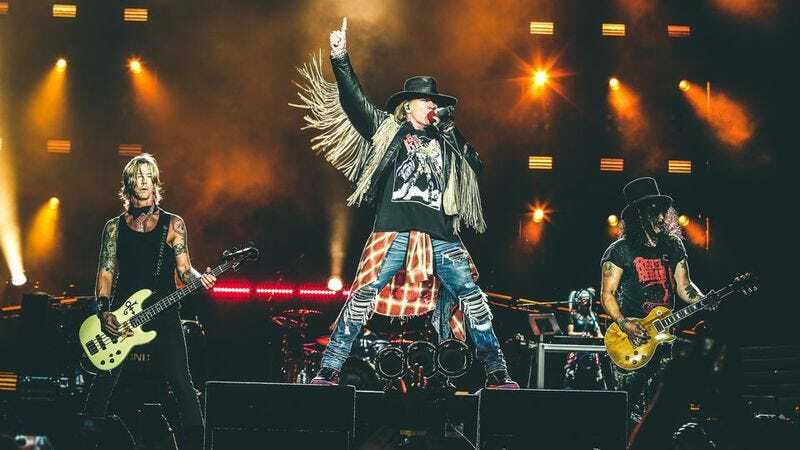 Lest anyone worry that Guns ‘N’ Roses might be losing its edge after the band stunned Chicago fans by starting their Soldier Field show 15 minutes ahead of schedule—or two hours and 15 minutes earlier than they would have at one time—they did something to make everything right. They got caught traveling with a gun. On Friday night, their tour bus was stopped and searched while they were crossing the Canadian border, and that’s when authorities discovered the contraband, according to E! News. A representative of the band’s revived almost-original lineup confirmed to Billboard that the very rock ‘n’ roll incident did in fact occur to the group of middle-aged millionaire musicians, but insisted that the gun did not belong to an actual member of the band.